Hello guitarists. Here is a quick, palm-muted, series of open 6th notes to play when opening a A Major based song. 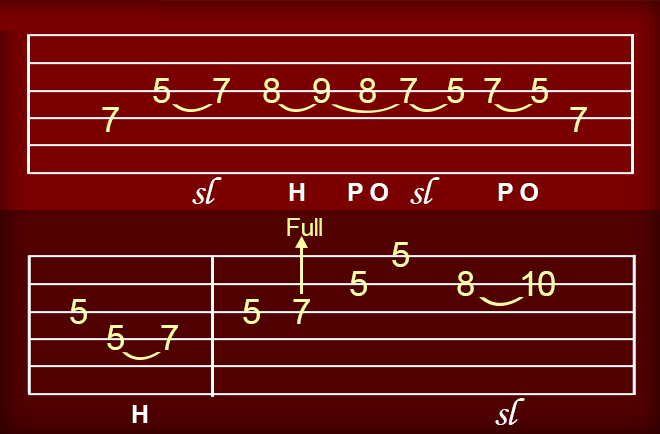 Certainly, the idea can be used to resolve to any key you’re playing in if you change the starting point of your 6th’s. Try listening to Rick Derringer’s solo to “Tobacco Road” on the 1970’s Edgar Winter “White Trash” album. You’ll get the picture! 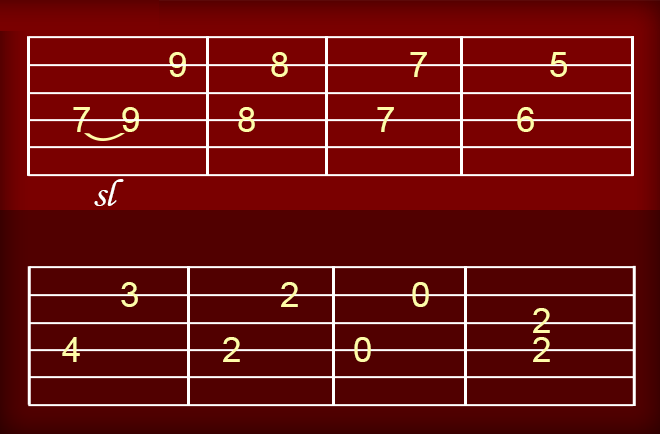 The tablature for this practice lesson is below and following that is the audio of what it should sound like in both full and half speed. Here is a little extra something in the way of a lesson this week. It is a tasty little one where you will be exposed to BLUES DRONE NOTE playing. Props to my man Hadden Sayers, my band-mate, for his expertise in playing this great style of blues. It is from him that I capture this style of playing. When playing a solo, so many thoughts run through your head in fractions of seconds. One of my favorite rock “go-to” licks is the “circle.” (If you’re not sure what this is, check out my “Learn To Jam” course.) In this lead I play here, I use a “half circle” to help get me finish with an up-the-neck note. In addition, I have thrown in a short chromatic run which uses the pinky and takes a while to execute in a smooth fashion. After you have learned to play this lead segment, you truly will have accomplished some important blues, advanced-level playing articulation. Good luck. Did you note that this week’s lesson provides the audio in both a full and half speed format. There is a reason for this, and we talked a little about the usefulness and power of slowing down audio for guitarists in the last newsletter. The Youtube video below is about a instructor from North Carolina that was introduced by one of his students to the slow down concept. Now, not only does he use the software, but 20 of his 24 students also use the this software. It’s that time of the year when everyone is outside and on vacation and generally just away from their guitars, so to get your attention I am offering a 50% discount on my groundbreaking Learn2Jam Guitar Soloing System. The concept of geometric shapes mentioned last week and again this week is just one of the things I cover. Most importantly, I boil down all of the skills and techniques you need to solo into just four songs. That’s right, if you learn these four songs that I will teach you note by note, you will have all the tools necessary to take a solo to any song, in any situation. BUT, in addition to this, if you buy Learn2Jam, the Song Surgeon folks have also agree to give you a 50% discount of of Song Surgeon Standard. That means that instead of paying $69 you can grab it for 34.50. You will see this item offered immediately AFTER you buy Learn2Jam… if you’d like it just select yes, and if not click the NO button. But… I am going to sweeten the pot even more… if you buy BOTH of these items I will throw in a copy of my Guitar Leads Master Volume. This is an oldie but goodie collection of 425+ guitar riffs and practice segments from some of the best classic rock songs of the 60’s, 70’s and 80’s. 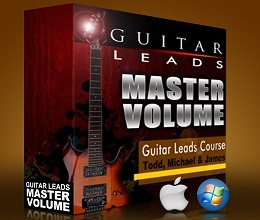 This is a $97 product – and it’s yours absolutely free when you buy BOTH Learn2Jam and Guitar leads. Please note, this free gift is unadvertised. It will not appear anywhere on your order, but it WILL BE in your package when it arrives. Alternatively, if you’d like to just buy Song Surgeon (but at a 35% discount) here is the link to do that. We are in the middle of my gig season and I don’t have a lot of time, so I am recycling a couple of older videos. I am working on some new lessons for next week, so stay tuned for those. This week’s lesson continues this idea of geometry I explained in last weeks video. This week we focus in on something called a circle lick. It will probably be one of the most crucial lessons I will ever give to you. It took me a number of years to try to figure out what I was hearing in some of my favorite Rock leads. Well, here it is! Watch my video below and and learn how to play this circle lick. This video examines the value to a guitarist of slowing a riff or solo or song down. In includes evidence from Google, and from guitar courses and instructors – and evidence from a survey of guitarists. It’s from my buddy Jim Todd who owns Song Surgeon. While I am amazed at the number of musicians and guitarists who use slow downers, I am equally amazed by the number who still resist and don’t see the value in it. If you are one of those, this just might change your mind. Here it the video link. My buddy Jim Todd, who runs Song Surgeon has recently released a new version of his popular software. His new version 4 (windows only right now) has something in it called “Speed Trainer” that I found very interesting and useful. Speed trainer is a function that allows you to set a beginning and ending tempo for a song (or a segment like a solo) and a percentage change. Once you start it playing it will loop continuously and every time it loops (repeats) it will increase the speed by the percentage change you set until you reach the ending tempo. For example, you might create a loop for a guitar riff you really want to learn and set beginning and ending at 50 and 100% with a 10% change. The program will the looped area at 50%, then 55, then 60, then 65%, etc., gradually increasing the speed until it hits 100%. The following video illustrates how it works. 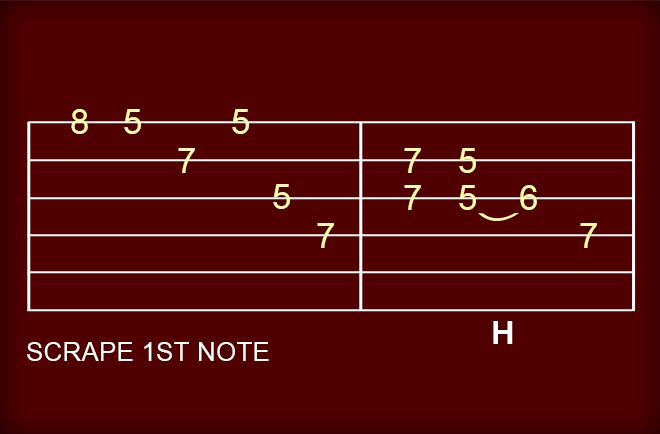 We recently uploaded a new lesson for our GuitarRx phone and tablet app. This was a 17 part lesson of the classic rock song, Reelin in the Years, by Steely Dan. We recently uploaded a new version of the GuitarRx for Android to fix a problem that some people were having. In addition we are finishing up some changes on the app for both Android and IOS that will allow user to better organize their lessons by creating folders in which to store their lessons. We will keep you posted but should have this new version available by the end of the month. p.s. We received this email from a satisfied customer earlier this year. I think your Guitar Course is great. I sent the copy I bought to my son stationed in the military in Europe. I also play the guitar. However, I’m in my sixties and don’t play as much anymore. I like the process of slowing down the songs. The hardest part is timing. I’m sure that comes with practice. The tabs are relatively easy. 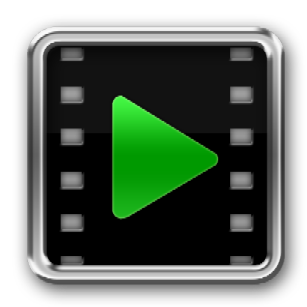 I did not get to review all the video’s in the course. If the course demonstrates the timing in each type of tab, that would be great. The other problem I have is speed. Once again, I’m sure that comes with practice. I may order another course for me in the near future. My guest guitar instructor Will Landrum is back again this week with another guitar riff to help you with your technique and timing. In this week’s video, Will shows you the correct right hand technique (and left hand too of course) for what is probably THE most famous guitar riff in history! Make sure you’re playing this one right! Along with tablature and sheet music, Will’s demonstrates these riffs at normal and slow speeds… and then gives you some helpful tips. Have fun with these NEW guitar lessons! Will Landrum is back again this week as my guest guitar instructor with two more fun guitar riff videos for you to help improve your technique and timing. Along with tablature and sheet music, Will’s demonstrates these riffs at normal and slow speeds… and then gives you some helpful tips. We have complete a lesson on the Steely Dan song, Reelin In The Years. It has been uploaded to the Google and Apple Stores and we are waiting app roval which should happen momentarily. 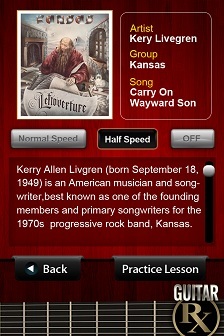 When it does we’ll send a short text message to all GuitarRx app users and let them know this new lesson is available. If you don’t have our app installed you might want to consider doing that. If you have an Android or iOS based phone or tablet, I encourage you to check out this app. There is a nice video illustration of the app at our website: www.guitarrx.com. It is once again summer and my gig season is heating up, so I have asked my friend and guitar wiz Will Landrum just posted TWO BRAND NEW VIDEOS where he shows you exactly how to play some really hot rock guitar riffs. Not only are these riffs fun to play and sound killer, they will also improve your technique and timing! Along with tablature and sheet music, Will’s demonstrates these riffs at normal and slow speeds… and then gives you some helpful tips. Have fun with these NEW guitar lessons! I have been working on a new app lesson for the GuitarRx app. It is Reelin in the Years by Steely Dan. This should be done within a couple of weeks. If you have our GuitarRx app you will get an automatic notification of when it is available. This week, I want to send you off with a BIG 2-For-1 guitar lesson by my friend Will Landrum. In lesson 4 of this 5 part series, Will shows you how to play a HOT and often mis-played riff by Ritchie Blackmore called “Burn”. After seeing Will’s video, I realized that I’ve actually seen famous well known guitarists play this riff wrong. Will sets you straight on this one. Also in lesson 5 of 5, Will shows you how to play the classic riff from the Beatles “Day Tripper”. Our GuitarRx app has been out just over two months and has been downloaded almost 5000 times. It has been about a 2 1/2 month since we launched the GuitarRx App for smartphones. If you have an Android or iOS based phone or tablet, I encourage you to check out this app. There is a nice video illustration of the app at our website: www.guitarrx.com. This week I am literally out to sea, playing on the cruise ship that I mentioned to you in the last couple of newsletters. Needless to say, I have someone filling in for me, and that would be my friend Will Landrum, who is back again as my guest guitar instructor. This week, he takes you on a “Free Ride” to another great guitar riff to improve your technique and timing. Not only does Will demonstrate this music with the utmost professionalism, he always transcribes what he’s teaching to tablature and sheet music to ensure you learn it correctly.